Anthony Galea with the award. 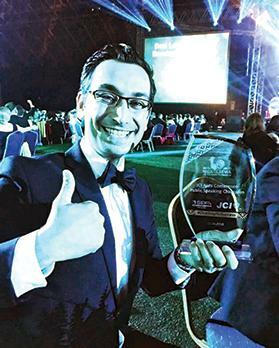 Anthony Galea, a lecturer at the University of Malta’s Faculty of Science, recently won the European Public Speaking Championship at the 2018 Junior Chamber International European Conference, in Riga, Latvia. Dr Galea, the JCI Malta representative at the event, will now go on to compete for Europe in the 2018 JCI World Congress to be held in Goa, India, in October. In the competition’s semi-final round Dr Galea had to deliver a presentation on ‘Sustainable transport is essential to achieving most, if not all, of the proposed Sustainable Development Goals’, whereas the theme of the final round was ‘To successfully achieve the Global Goals for Sustainable Development by 2030, young people must increase their role as active citizens in their local communities’. In front of 1,300 delegates from 60 countries, Dr Galea gave a talk on the invasion of plastics in our seas, and impressed the competition judges and the audience with his talks, which he turned into mini science shows, incorporating humour and props. This is the first time a participant from Malta has won the award. Three other JCI Malta delegates – Rachel Cassar, Nicole Borg and Christoph Schwaiger – competed in the English Debating Championship and reached the final round. Besides the competitions the JCI European Conference also included various training sessions targeting effective communication, management and business. To view videos of Dr Galea’s winning presentations during the semi-final and final respectively, visit the links below. JCI is a worldwide nonprofit organisation of young active citizens committed to creating positive impact in their communities.